The Jr. Iditarod salutes Stan as Sally Smith as the honorary mushers for the 2017 race. The Smiths will be wearing bib #1 for the start of the 40th Jr. Iditarod. The race will begin on Saturday Feb 25th at 10:00 am within shouting distance of Joe and Vi Redington’s former home place on Knik Lake. Thirteen mushers ranging in age from 14 to 17 are ready to compete in the Jr. Iditarod. It’s a long-standing tradition for both the Jr. Iditarod and Iditarod to honor people who have given their time, energy and talents to the race. The Smiths began volunteering for the Jr. Iditarod and Iditarod some twenty years ago. It all began in a small way when Stan fell in love with the canine athletes. Stan, with the help and support of Sally, won a 2-dog skijoring race in 1989. Stan had caught the mushing bug and it was contagious for the rest of the family. Stan finished the Iditarod in 1993 and 1994. The Smith children also participated in the Jr. Iditarod. 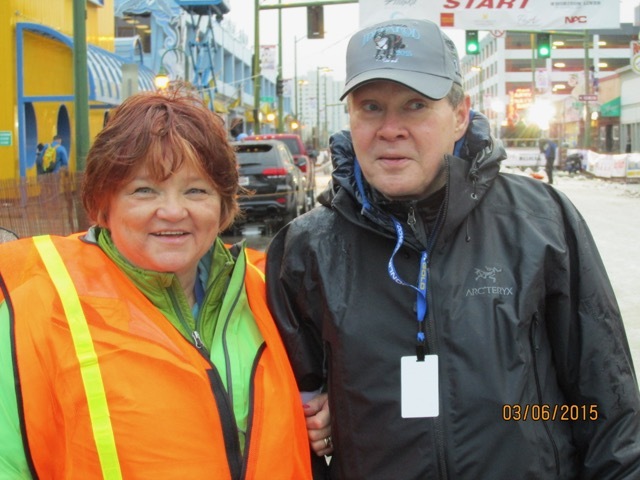 Their love of the dogs and the Iditarod Races prompted Stan and Sally to join the army of volunteers that make the races happen. Stan started by doing trail work for the Jr. race and Sally was a volunteer coordinator. The Smith’s have also been sponsors for the Jr. race. They’ve helped with dropped dogs as well as the summer volunteer picnic. They could always be counted on to help where help was needed and to give generously of their time and energy. The Smiths are real salt of the earth people when it comes to the Jr. Iditarod. A race like this couldn’t happen without people like Stan and Sally giving their all for the good of the kids, the dogs and the race. For all these years and the countless “little things” they’ve done to help make the Jr. Iditarod what it is today, we celebrate and thank Stan and Sally Smith.